The same webbing system as the elevating express is used except that the conveyor carriage is fixed centrally on the front of the mixer. The conveyor can discharge to both left and right sides. Only two hydraulic outlets from the tractor, one for the door and the other for the conveyor, these can be connected direct to the tractor spool valves or optional manual lever or electric controls are available. 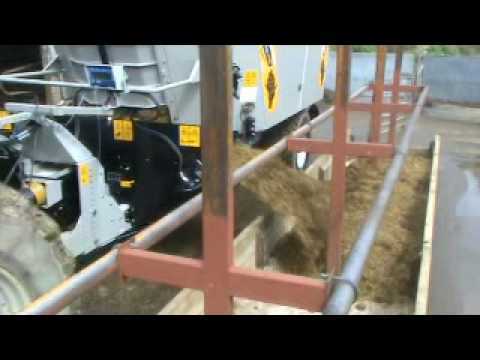 The conveyor speed can be varied using the hydraulic flow control giving the machine the versatility to simply drop the feed alongside the machine or throw feed into the centre of a trough. The unique Shelbourne webbing system gives the clean throwing performance of a belt system with no carryround and the positive traction and servicability and durability of a chain and slat system. The conveyor discharge height can be changed either by using axle spacers to raise the tub or larger diameter wheels.